Join us on an alpine adventure in glitzy Val d’Isere. We can look forward to a heap of included activities including mountain biking, hiking, rock climbing and kayaking. However if you prefer to take it easy, you can soak up the magnificent views from our hotel, indulge in the daily afternoon tea or curl up with a good book. The beauty of this trip is that we can do as much (or as little) as we like! Perched high in the French Alps, Hotel Gelinotte makes for a wonderful base for our activity week it exudes plenty of alpine charm and style and with a large dose of hot mountain sun to tempt you away from the beach! 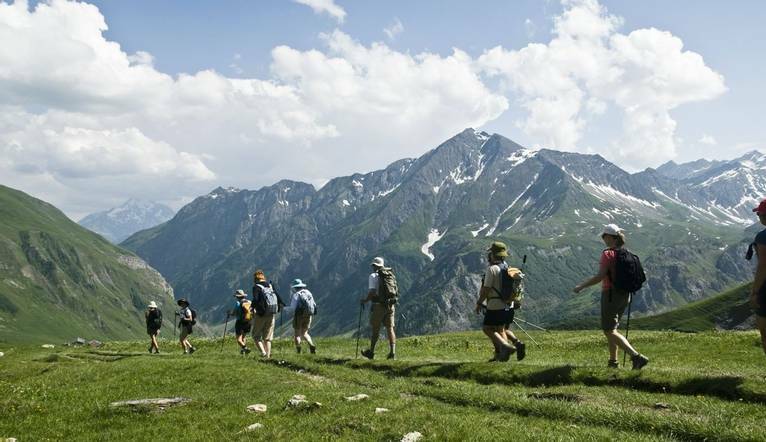 As one of the most famous alpine resorts in the world and as part of the Vanoise National Park you can expect an array of mountain activities on offer to keep us entertained all week, whatever your taste. Including: mountain biking, rafting, climbing, canyoning which all take place close to our hotel. Outside of the hotel, the resort teems with life, and we won't be able to tear ourselves away from its tempting shops, bars, open-air markets and cafés! *£5pp transport charge - activity is free. A week of great activities in the mountains. Well organised by the Solos Tour Leader Tim and the Alpine Element team in Val d`Isere. The white water rafting was the highlight of the week! Our hotel is based in the ritzy alpine resort of Val d’Isere in the southern French Alps and enjoys panoramic views of the surrounding area. It is centrally located with just a 5 to 10 minute walk (or 2 minute cycle) to the activities, shops and bars, but there is also a minibus service in operation. The hotel has a bar, restaurant, comfy lounge, Wi-Fi plus, swimming pool, sauna, stream room and there is also a quiet lounge for reading or board games. All rooms have en-suite facilities and many have wonderful mountain views. Insurance (please ensure that you have adequate insurance for the activities on offer). Please see here.